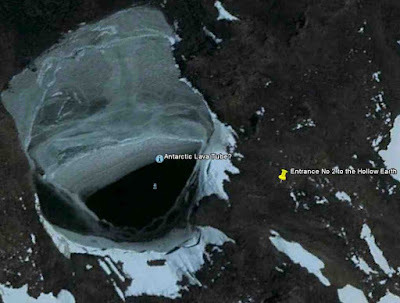 Ghost Hunting Theories: Journey to the Center of the Earth Week: Potential Openings to Earth's Center? Journey to the Center of the Earth Week: Potential Openings to Earth's Center? As I got older and learned about Hollow Earth Theory, I was hooked on the concept that the earth has layers, other worlds, and lost civilizations perhaps, and life adapted to the darkness or perhaps with its own intense bioluminescence. In fact, we have found through CCD cameras and EMCCD cameras that humans have bioluminescence! What is exciting about all of this is that they have discovered a vast ocean under the earth that contains three times more water than is found on the earth and shows an obvious source of where our water might have come from on our planet. SOURCE: The water is hidden inside a blue rock called ringwoodite that lies 700 kilometres underground in the mantle, the layer of hot rock between Earth’s surface and its core. Journey to the Center of the Earth - Possible? The actual physical travel to the center of the earth? That would be impossible and this site (LINK) gives a great description - It gets very hot very quickly as you journey towards the center of the Earth. In the Earth’s crust — the outermost shell of the planet that reaches down around 30 miles (50 km) — temperatures increase by around 25 Celsius per kilometer of depth (77F every 0.6 miles). This means that, once you’re about 10 kilometers (6 miles) down, temperatures are already as high as 250C (482F). Once you’re through the crust (about 30 miles down) and into the upper mantle, which consists of partially molten rock, you’re talking about temperatures in the range of 650-1200C (1200-2200F). We don’t know exactly, but the Earth’s inner core is theorized to have a temperature of around 6000 Kelvin (5,700C, 10,300F). In case you’re wondering, a lot of this heat is believed to come from the decay of naturally radioactive elements (uranium, thorium, and potassium). The center of the earth aside, how about the idea of a world within our world? Perhaps somewhere in the crust, but less than that dangerous 6 miles deep? How about pockets of earth that offer different geology and a better chance of having a deep pocket at a comfort level that is human being viable? 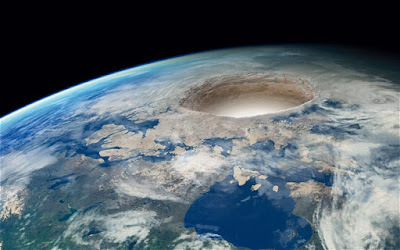 Here's an explanation of Hollow Earth theory from this great site (LINK) According to the Hollow Earth Hypothesis, planet Earth is either wholly hollow or otherwise contains a substantial interior space. The hypothesis has long been contradicted by overwhelming observational evidence, as well as by the modern understanding of planet formation; the scientific community has dismissed the notion since at least the late 18th century. The concept of a hollow Earth still recurs in folklore and as the premise for a sub-genre of adventure fiction. It also features in some present-day pseudoscientific and conspiracy theories. Underground civilizations link with the 'Hollow Earth Theory'. There are supposedly races that exist in subterranean cities beneath planet Earth. Very often, these dwellers of the world beneath are more technologically advanced than we on the surface. Some believe that UFOs are not from other planets, but are manufactured by strange beings in the interior of the Earth. Journey to the Hollow Earth? Mt. Shasta has long been associated with little people, giants, aliens, UFOs, Lemurians and Hollow Earth entrance. There is an account of a "Traveler to Inner Earth" by a supposed US Air Force Colonel who traveled by way of Mt. Shasta (LINK). The atmosphere is crystal clear, as a rule there are times clouds, but nothing like rain clouds. The temperature is a constant 73 degrees. There is no need for hoarding for everything is free, no need to create in abundance as everything is ample. A process of bartering is more common than trade in money. This was mentioned in a writing by a Norwegian who said that he and his father had voyaged to Hollow Earth by accident. The last bit of land they recognized as they ventured forward was the never inhabited island, Josef Franz Island. 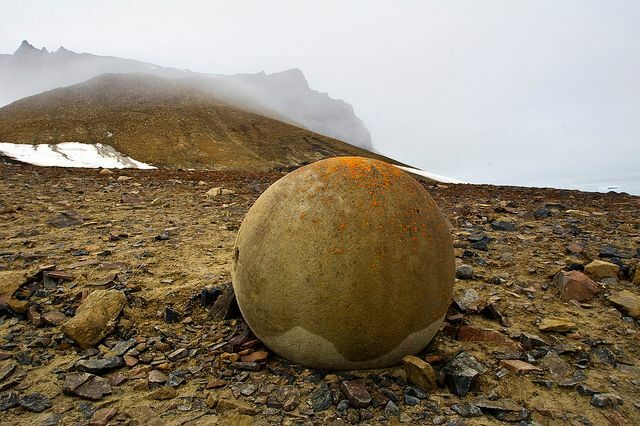 Interestingly, this island has enormous stone perfectly round spheres, but no one has ever lived in this inhospitable place. The story this man, Olaf Jansen, conveyed of his voyage in the 1800s was written in the most fascinating account called "The Smoky God" (LINK). Eden is an elevated beautiful garden through which four mighty rivers run in four directions dividing the the planet's interior. Earth's inner surface is three fourths land and one fourth water. This garden is the "navel of the earth" and the "cradle of the human race".The names of the rivers are Euphrates, the Pison, the Gihon, and the Hiddekel. They spoke to the Priest for over two hours on various issues and then had to decide whether to stay or return to the outer earth. They decided to stay a while longer visiting more cities and learning more cultures. The children go to school for thirty years starting at age twenty. The learned men have an accurate idea of the earth's outer geography, and the general people are extremely musical and well educated in the arts and sciences, especially geometry and astronomy. Marriage occurs a little before or after 100 years of age and people generally live to be 600 to 800 years old. The animals there can be huge; birds with wingspans of hirty feet, tortoises up to thirty feet in length, and elephants up to 85 feet in height. Some of the trees here grow to 1000 feet in height and are 120 feet in diameter, and the forests extend hundreds of miles. A mist rises every evening and comes down as rain every twenty-four hours. 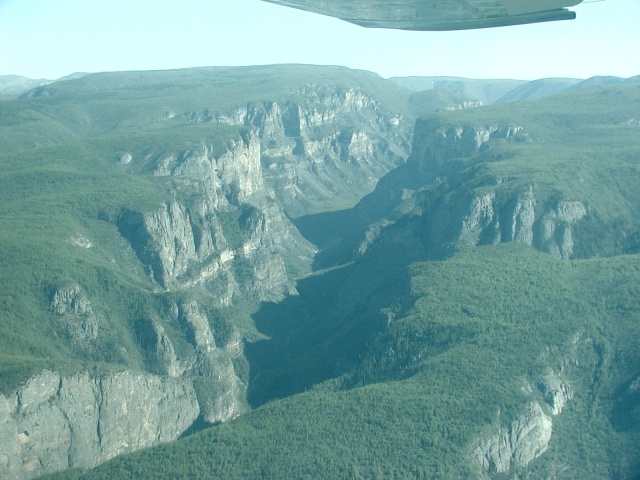 (LINK) An entrance is reported to have been found in the Nahanni Valley of B.C., but it is said that some of those who have dared to enter this area have been found decapitated, thus giving the region its name “The Valley of the Headless Men.” The Nahanni Valley in Canada is the ancient territory of the Ojibways, the Slave, Dogribs, Stoney, the Beavers and the Chipweyans. It covers 250 square miles in the southern end of the Mackenzie Mountains of Canada and lies almost 550 miles due west of Fort Simpson on the Mackenzie River of northwest Canada. Natural hot springs and sulfur geysers keep the valley warmer than the surrounding areas by about 30 degrees Farenheit year-round. This land of perpetual mist has always been viewed by the Indians as “taboo” and avoided. A team was formed hoping to make an expedition to the North Pole entrance to Hollow Earth. (LINK) It seems the expedition is on hold until funding, but it intrigues one to consider taking a schooner up to the opening of a supposed nirvana inner world. The planned expedition sounded pretty neat and included lots of scientific experiments while up there. As well, it was said that Admiral Byrd had flown into the mild temperate zone and met up with the beings of Hollow Earth. It's hard to dismiss basic geology, so far as what we believe the Earth to contain and it's a pretty good guess considering the drilling, understanding of geological plates, seismic activity, and the like. But, what remains is the very real possibility there are pockets of great space - such as the world's largest cave only recently found in Vietnam. It is with certainty that inner earth would have plenty of water, but would the temperatures make it impossible to exist? Perhaps. And, perhaps conditions exist in permafrost regions of the globe, where the supporting mantle varies, perhaps allows for a filtered light through ice or other means. After all, the cave in Vietnam has a forest inside. Could an entire civilization of advanced people live in a retreat within the Earth? If they do, they were smart to locate such a location that could allow for vitamin D, growing plants, fresh water, clean air and the like, without being vulnerable to what we on the surface must face, like weather conditions, oceans, and temperature changes. Still, the concept that one could live in and thrive inside the earth almost begs for a type of man that evolved differently to handle some deficits in resources and sunshine. This is not even taking into consideration what happens when there are earthquakes and volcanoes acting up! 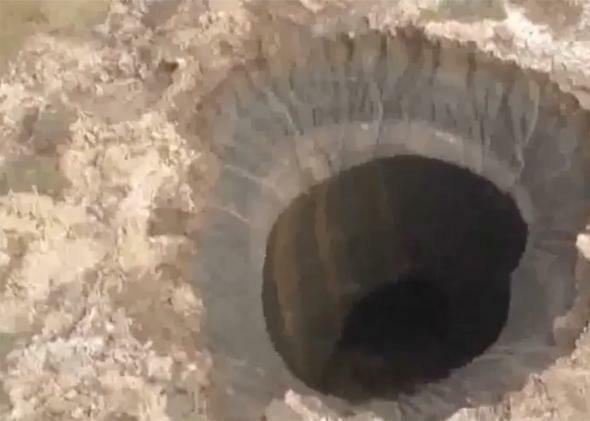 I suspect at some point, we might find a cave that goes deeper than any cave, perhaps a situation in which a hole opens up like the enormous ones in Russia (LINK), that make us wonder - just what is in there?